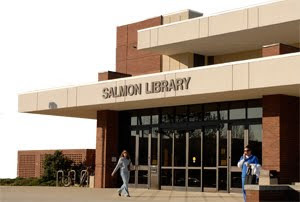 Dr. Stephen Waring will be in the gallery of the UAH Salmon Library from 1:00 to 3:00 pm Sunday 28 February to answer questions and conduct brief tours of the exhibit. No appointment is necessary, just drop in. Future drop-in tours and discussion times will be posted on our Schedule page. If you have a group that would like to schedule a tour, please email us at dora@uah.edu; we will do our best to accommodate your schedule. Metafilter's story on our webpage. "Great post. From a digital history perspective one thing that interest me about the site is the way it does not try to host every file but liberally links to and incorporates relevant content from stable sites such as Archive.org. That may sound like no big deal but it is pretty unusual in a big digital history project like this one. A case in point are the newsreels hosted at Archive.org. This one: "“Nazi Murder Mills,” April 4th 1945 Newsreel based on Army footage, includes Nordhausen and reference to work on V2s" is chilling. 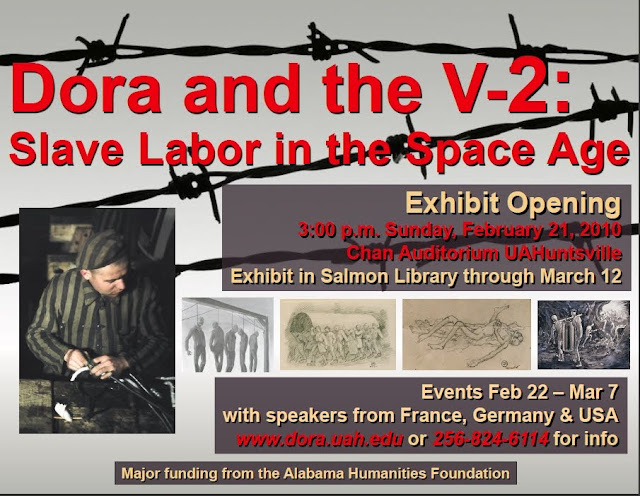 posted by LarryC at 6:50 PM on February 22"
The University of Alabama in Huntsville will host an exhibit titled "Dora and the V-2: Slave labor in the space age" this month. The historical and art exhibit explores the history of forced labor in the construction of V-2 missiles at the Dora concentration camp and Mittelwerk underground factory near Nordhausen, Germany, during World War II. The exhibit will be in UAH's Salmon Library beginning Sunday through March 12. It is free, open to the public and sponsored by the Alabama Humanities Foundation. A section of the exhibit focuses on Wernher von Braun, saying that after World War II he and other German engineers tried to distance themselves from the use of slave labor. "However, historians in the last 30 years have discovered written evidence linking the engineers (including von Braun and Arthur Rudolph) to forced labor," the exhibit states. The exhibit, which focuses on the victims of V-2 production, features the first U.S. showing of work from two European museums: La Coupole, Historic and Remembrance Center in Saint-Omer, France, and the Mittlebau-Dora Concentration Camp Memorial and Museum near Nordhausen. From La Coupole, the exhibit features color photographs of V-2 forced labor as well as artwork from victims and survivors. From Mittelbau-Dora comes a traveling collection of posters telling the stories and experiences of people in the camp and factory. Yves Le Maner, director of La Coupole, and Dr. Jens-Christian Wagner, director of the Mittelbau-Dora memorial, will speak at the exhibit opening Feb. 21. Author Michael Neufeld, author of books on the V-2 and von Braun, will speak Feb. 25. Please click on the image of our poster, download, and print for your office, house of worship, library, or school! Several community members have asked about why there were significantly fewer Jewish than non-Jewish prisoners at the Mittelbau-Dora concentration camp. 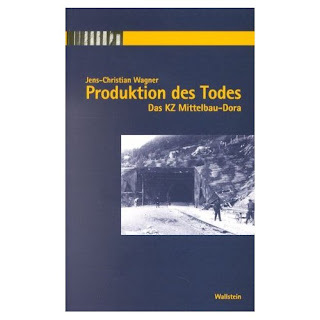 We asked Dr. Jens-Christian Wagner, the director of the Mittelbau-Dora Concentration Camp Memorial in Germany and the author of the pre-eminent book on Dora, Produktion des Todes: Das KZ Mittelbau-Dora. Dr. Wagner emphasized that there were two different kinds of camps in the Nazi system, concentration camps and extermination camps. People often hear "concentration camps" and think of extermination camps, but these were not the same thing, even though some of the larger complexes had both, such as Auschwitz-Birkenau -- Auschwitz was a concentration camp and Birkenau an extermination camp. Most concentration camps were located on German territory and considered part of the "Reich." The majority of the concentration camp prisoners were non-Jewish and non-German prisoners, primarily arrested for resistance against German occupation, and transported into the territory of the "Reich" for incarceration. Other concentration camp prisoners included German "criminal" prisoners, other political prisoners, and prisoners pinpointed as "asocial." Until 1943, Jews were systematically deported away from the Reich in order to make the Reich "judenfrei," or "free of Jews." They were deported to extermination camps in the German-occupied East. At the outset, therefore, there were no Jews at Dora. Once there was a shortage of labor in 1944, Nazi leaders reconsidered and began to bring some Jewish prisoners into the Reich for labor, including Hungarian Jews transferred into the Reich via Auschwitz, including 1000 men and teenage boys brought to Mittelbau-Dora. Most did construction work at the Dora sub-camp Ellrich and died. In September 1944, 300 more Hungarian Jews arrived at Dora and engaged in V-1 production. At Dora, they were involved in confidential, secret rocket production, and they had better conditions as "production prisoners" than those sent to construction sites. Most of these 300 survived. Jews at Dora were usually the lowest of the low in the camp hierarchy, targeted for special mistreatment from SS and Kapos. The Jews also lived separate from the other prisoners, including the V-1 prisoners, who had an isolated barracks at Dora that one survivor, George Stein, called a "prison in a prison." Towards the end, the isolation diminished somewhat and there were even several Jews in the Mittelbau-Dora system working as caregivers in the infirmary and in several cases named Kapos and Vorarbeiter. Yet these were exceptions. Most Jews at Dora did hard construction work and suffered greatly. In the winter of 1944 and 1945, as the Eastern concentration and extermination camps were abandonded, transports of many thousands of Jews from Auschwitz, Gross-Rosen and Tschenstochau arrived at Mittelbau-Dora and Dora became a clear site of the Shoah/Holocaust.